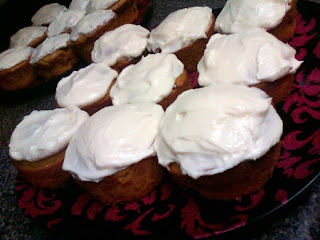 Flour Mayhem: Dear Cream Cheese Frosting.. I'm not sure if you've noticed, but I make a lot of things that are frosted with my cream cheese frosting. Sometimes I just make it because I want to. There's nothing wrong with that.. Right?? The last nearly 2 weeks have been crazy, got my hand tattooed, trying to finish our travel plans, started a new job, and got my inner thigh tattooed.. OUCH! 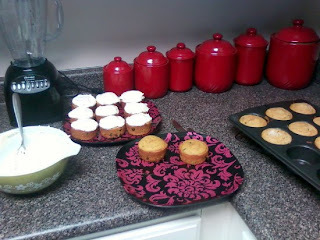 But all in all a good 2 weeks, and even though my hand is still healing, I am able to move it more and wanted to bake. I had a leftover can of pumpkin, so I wanted to do something with that. 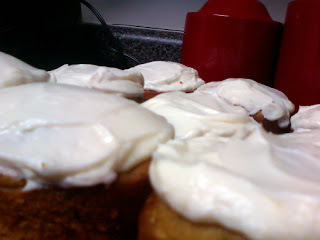 After much thinking, I was dead set on pumpkin chocolate chip muffins with... you guessed it, CREAM CHEESE ICING! 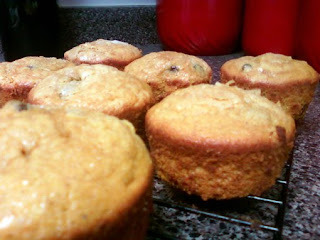 They are yummy, and I'm so glad that I found that sneaky can of pumpkin hiding in the pantry. So, let's give a big thank you to the little guy, without him, these cupcakes would not be here today. Preheat oven to 350 degrees. Spray a regular size muffin tin with cooking spray or line with baking cups. 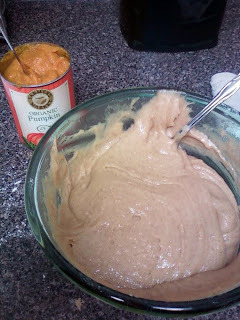 Sift together flour, baking powder, salt, and pumpkin pie spice. Add the brown sugar, granulated sugar, and melted COOLED butter. Add the eggs, and mix well until no streaks of egg appear. Mix until smooth. 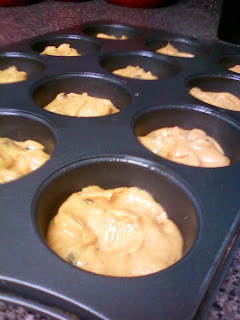 Stir in pumpkin and chocolate chips. Fill each cup in the pan half full, bake for 25-30 minutes. Let cool on wire rack completely. Go ahead and make your frosting. Cream together the cream cheese and butter, add in vanilla and one cup of powdered sugar. Mix until smooth and combined. Add last cup of powdered sugar, and beat on high until light and fluffy. Now is when you do your taste test, if you want it sweeter add 1-3 more cups of powdered sugar, if it's just right (to me it would be!) then there ya go! Get to frosting those cupcakes baby! Like I said, I just had my hand tattooed on Monday, so I may not be the best froster today, but the taste is still there. BELIEVE ME! Go bake some cupcakes, make somebody smile.. I am pretty sure when my love gets home he may have one, or two, or three... But hey, I'm not counting! man o man!!! im sooo hungry and those look amazing........ yummy!!!!! !